It's an idyllic summer scene: a group of boys on their way to the park for a game of ball. When they finish their game of camaraderie and fun, they'll wind up at one boy's house to schmooze, have a glass of cold lemonade and work on the clubhouse in the backyard. It's also a fantasy, a wistful dream that does not exist anymore. Whereas in previous generations, summer was a time for kids to kick back, relax and make their own schedules and their own fun, in our generation, leaving healthy kids without structure and careful supervision is nothing short of dangerous. As Rabbi Gedalia Oppen, Principal of Judaic Studies at HAFTR Elementary School explains, "camp is not a luxury. It's a necessity. Just like you have to eat - but you don't have to have steak every day - you don't have to choose the priciest, fanciest option. We have seen how quickly children who are not in a structured setting can and will get into trouble. Without the proper environment, these few weeks in the summer can literally destroy all the time, effort and money invested in our children's chinuch the entire year!" Three years ago, Rabbi Yaakov Bender attended an Achiezer board meeting and shared the same sentiments, gleaned from his over forty years of experience in chinuch. Thus was born Achiezer's Summer Camp Fund, which, in conjunction with the Davis Memorial Fund and the Leon Lief Fund, works to ensure that no neighborhood children are left at home this summer due to lack of funds. "If ever there was a communitywide initiative," shares Rabbi Boruch Ber Bender, President of Achiezer, "this is it. Last year we serviced 121 families from more than 45 different shuls and with children in virtually every local elementary and high school. These are people from every neighborhood, of every affiliation, who are turning to us for help with this vital need. Those who apply are treated with the utmost dignity and each application is evaluated individually. Many children in question are from families with two working parents, for whom the expense of camp on top of year-round tuition obligations is overwhelming. However, leaving their children home alone is not an option. "We can only help as many people as funds that are contributed, and that's where the community comes in," shares Achiezer's Program Coordinator, Aliza Wartelsky. "As Rabbi BB Bender explained, this is a program that is totally for the community, by the community. 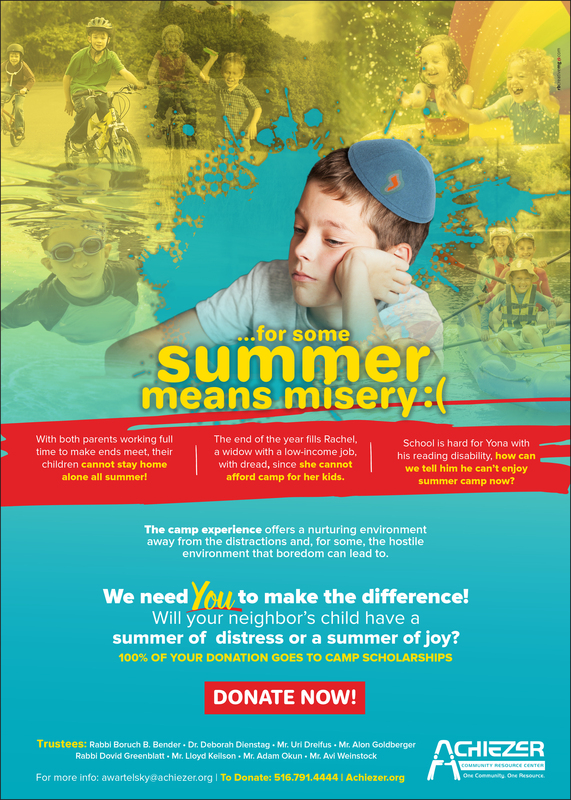 Says Rabbi Yaakov Bender, Rosh Yeshiva of Yeshiva Darchei Torah, "Camp is expensive, but most of us are able to send our children to camp this summer. It's worthwhile to take care of those families who are not able to do so. What goes around, comes around. By participating, you will surely reap the benefits." Camp is more than just fun and games. It's an investment for life. Several veteran mechanchim from our local schools and yeshivos share their perspectives. What is so important about the camp experience? Summer vacation lasts, unfortunately, for one-quarter of the year. It is not an option for children to be totally free, with no structure, for that amount of time. Camp is therefore not a luxury. It's a necessity for every child to be in a structured environment so that all the work of the remaining three-quarters of the year does not go down the drain. There are also yechidim who are regrettably living in a dysfunctional environment, and they need to learn to interact with their peers and build relationships in a normal way. The camp environment offers them this opportunity. This is their one chance to be immersed in a regular setting and to be like everyone else. Camps shelter our children from a hostile outside environment; they keep them safe and happy. Yes, luxurious camps are a luxury, but the concept of camp is not. There are good, solid camps out there that are filling this very crucial need. Camp is an unforgettable experience. New friendships are created, school labels are removed, it's a chance for children to forge new identities for themselves. In addition, children are occupied in a healthy way. When they are bored, they can get into trouble, and this challenge only gets worse as they get older. Camp is costly, but the benefits are crucial. If parents are not able to entertain and supervise their children for most of the day, it's the only option. And even in circumstances where parents choose to entertain their children on their own, the children lose the social benefits of the camp experience. The [sleepaway] camp environment is a kind of utopia. The children are removed from every other distraction, really from the rest of the world, and it's a chance for them to be uplifted and come closer to the Ribono Shel Olam. There is nothing like a camp Shabbos, with 300 or more children singing zemiros together. Camp is also a chance for children to tap into what excites them and makes them shine. What are some of the specific benefits children can gain from camp? Rabbi Bender: Camp can strengthen their Yiddishkeit. For some children who come from weaker homes, Shabbos in a sleepaway camp is the only real Shabbos they'll experience. There is also a certain camaraderie; children learn how to live with other people and interact in a healthy way. Rabbi Oppen: In school, the majority of the day is focused on academics, whereas in camp, there are so many other opportunities to shine. Children can explore who they are in a healthy, freer way. This helps them feel good about themselves and can really rejuvenate them, even academically. Also, I find that, as kids get older, school friendships are often based on academic ability. Camp allows them to branch out and identify with other types of students and recognize what they have to offer. Rabbi Neuman: In camp there is no pressure to conform and achieve scholastically. Rather, there's something for everyone to enjoy - whether it's sports, arts and crafts, singing or drama. I actually meet with my staff several days into camp to see which kids need a little bit more and talk about how we can help them feel good and succeed. Four weeks of camp can do more than ten months of school for a child's self-confidence. Why is it detrimental for a child to spend the summer at home - not in a camp environment? Rabbi Bender: I took an informal survey in our school and found that in 75-80% of homes, both parents are working. That means that, if a child is home in the summer, he is often home the whole day by himself. This means he's doing nothing - or worse, getting into trouble. On another note, we live in what is, by and large, an affluent community. But there are about 30% of families who do not fit this demographic, and for those children to be denied the chance to go to camp is not okay; they feel very deprived. Rabbi Kamenetzky: We are told, "Batalah meivi l'yedei shimum" - wasting time brings to desolation of the mind. When a child is not in a ruchniyusdik atmosphere, he can be filling his time and mind with terrible things. You can see the difference between a child who spends his summer in a Torah atmosphere and one who doesn't. Dovid Hamelech says in Tehillim, "Shivti b'veis Hashem kol yemei chayei." He doesn't talk about a summer vacation. One needs to be in a beis Hashem - a Torah environment - in the summer as well. Now we have wonderful camps where children can learn be exposed to Yiddishe ideas, sheltering them from an environment which is hostile, particularly in the summer. Rabbi Oppen: We invest so much in our children's chinuch: time, money and energy. If not utilized correctly, these summer months can destroy all of that. Even during the year, it is too easy for children to get into trouble. In the summer, when things are a lot looser, it is a much bigger challenge. Together with all our tefillos, we have to do our hishtadlus by putting our children in a safe, positive environment. Rabbi Neuman: Boredom itself is dangerous. Nowadays, with one click of a button, children can be exposed to the worst to'eivos. They don't even have to leave home to access this kind of material. Another important point is that children gain so much from being with other children outside of the school environment. They learn important social skills, how to get along with and appreciate other children. Schools today are wonderful, but the school day doesn't compare to being in a bunk with fifteen other children for seven hours a day, participating in activities together. The skills gained are skills for life. I want to add that while it is a must to send kids to camp, parents should take advantage of the slower pace of the summer - no homework, longer days - to really spend time with their children and take an interest in their lives. What has changed in this regard in recent times? Rabbi Bender: The streets are so much worse today than in the past. In the old days, a child could safely sit at home and read a book or play ball. It also used to be that there were fewer families in which both parents were working. But even when I was growing up, my mother ran a camp fund, so it was always prudent. Rabbi Kamenetzky: Children today don't know how to occupy themselves gainfully. What should a kid do when alone in the house that won't get him into trouble? Rabbi Oppen: Society has changed, accessibility to what's out there has changed. And self-entertainment for children really doesn't exist anymore. Children today can get into trouble so quickly. This is not theory, but fact. Rabbi Neuman: The world that we live in has become a difficult place to raise children al taharas hakodesh. Nowadays, in the outside world there are no inhibitions. A child who stays home is open to seeing kol davar assur - just by walking in the street. Many children who get into trouble today start on a simple level that could have been avoided.